About 430 million years ago, give or take a week or two, some little arthropods decided it was time to crawl out of the drying pool of water in which they had been feeding. They were a group of animals, now extinct, called euthycarcinoids. Think a big cockroach with eleven pairs of legs and a bit of a tail and you'll get the picture. A couple were about as long as your hand. Some, possibly juveniles, were as long as your little finger. Walking out of the water up a wet, sandy slope, they left behind their footprints. These we found fossilised in the Tumblagooda Sandstone, here at the top of the gorge of the Murchison River. Their behaviour, for maybe about 20 seconds of their lives, has been preserved like a snapshot in time. Now, walking up a slope like this was fine for the larger animals - straight up and out of the water. To the smaller ones, though, it was probably a bit more of a challenge. Maybe they found it was easier to walk obliquely up the slope. A longer climb, but a less steep one. We know they were all walking up the slope because of the tiny mounds of sand left behind the footprints as each foot pushed the animals forward. So how were such delicate footprints preserved? What was needed was the wind. This blew fine, dry dust over the wet surface, carefully covering the delicate footprints. More and more sand covered the surface and eventually, over vast tracts of time, the sand grains were cemented together by silica to become sandstone. For hundreds of millions of years the seas rose and fell, periodically covering the sandstone with other sediments. A mere 30 million years ago the land began to rise. The younger sediments were stripped off, the sandstones suffered the ravages of weathering until eventually the thin layer of windblown sand was peeled off to reveal the euthycarcinoids' footprints to a whole new world. OK. With my last blog I left you, the reader, rather hanging in the air. Well, more like dangling over a 430 million year old pool of water. 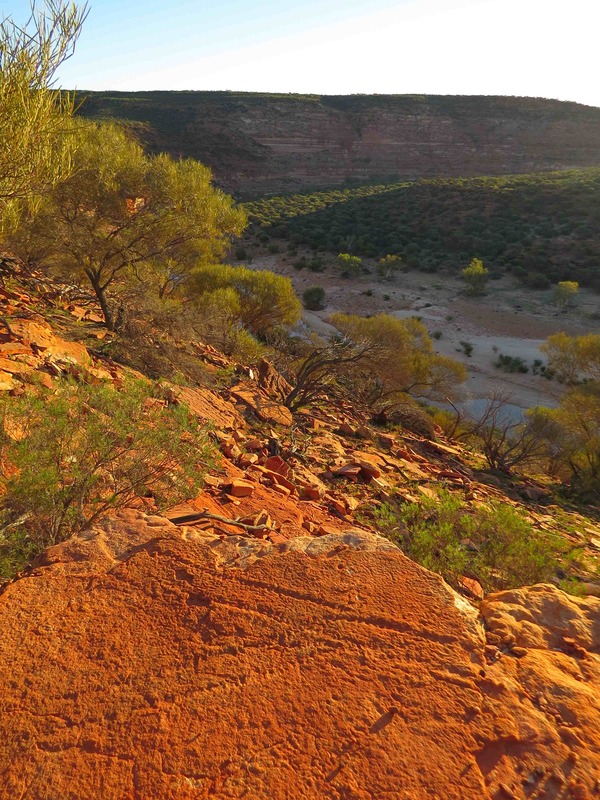 So how can I tell that a block of sandstone, perched on a cliff top high above the Murchison River was once a pool of water? You might be thinking that I've been getting a bit too much Sun. But reading the language of the rocks is what makes doing fieldwork like this so exciting – to be able to be transported back hundreds of millions of years to when the first strange creatures were dragging themselves out of the water onto barren, wind-swept land. (Some rocks even retain clues as to which way the wind would have been blowing on a specific day - but that's for another blog). Right, back to the pool of water. How to identify a Silurian pond? The sandstone slab, which you can see in the photo, consists of three main parts. To the right is a surface of what was once microbial mat - an irregular, pustular surface. You can see that, intriguingly, one piece of it has been displaced (shown by the arrow). By what, and how, will be revealed shortly. Then there is a smooth surface that slopes very gently to the left into some very clear rippled sands. And close to the ripples are sets of faint, parallel lines. The whole surface would originally all have been covered in water, maybe just a few centimetres deep. In the shallowest, warmest water microbes proliferated, binding the sand grains into a gooey, jelly-like mat. Then, as the pond began to dry out the water level progressively dropped down to the rippled surface - ripples generated by the wind. Fine strand lines mark the lowering water level. So, it was a shallow pool of water drying out in the hot Sun. But the really exciting activity had taken place before the pond dried out, when the microbial mat was still covered by water. Remember the piece displaced downslope? Behind it, and scoring into the microbial mat are clear grooves that represent the imprints made by the legs of an arthropod as it launched itself into the pond. As it pushed off its belly ploughed into the thin microbial mat, dislodging it and taking the slimy mat with it. Surely the earliest know example of sand-boarding! In the next blog I'll take you to another pond, where animals were venturing out of the water and also show you what we think might have been hunting burrows. The Sun was setting fast. Only about half an hour before it sunk beneath the horizon. But that was just perfect. For that's when the Sun's low, raking rays clipped the surface of Tumblagooda Sandstone, perched high above the Murchison River gorge in Western Australia. And there, running across the surface, like sets of miniature railway tracks, were three sets of parallel rows of little footprints made by multi-legged arthropods about 430 million years ago. Each trackway was as wide as my hand. One animal had followed another, then veered off to the left. Another, more faint set, had cut across them, moments later. Each trackway marked the activity of these animals for maybe just 20 seconds of their lives hundreds of millions of years ago. 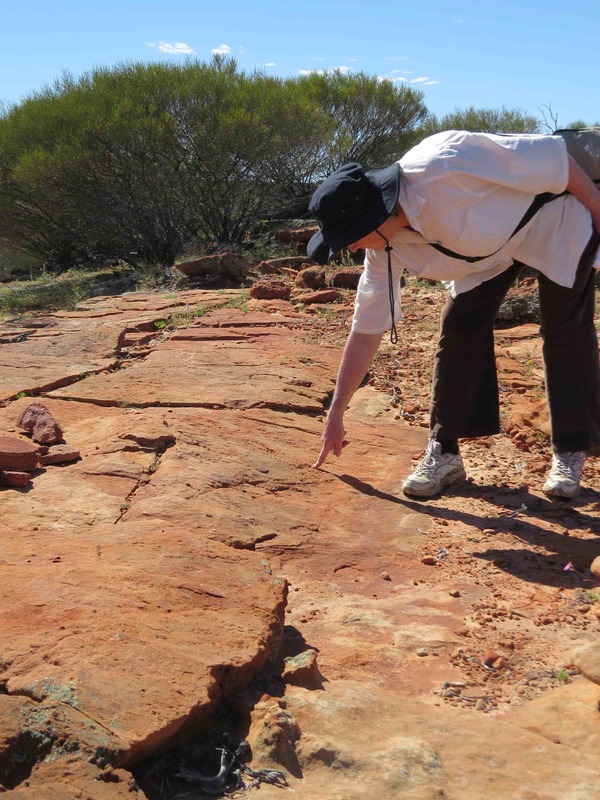 Seeking these trackways and other evidence of early life on land is why I've travelled across the world to Western Australia, some 600 km north of Perth. With funding from National Geographic I aim to find evidence to support the notion that this site holds the secret to the first freshwater ecosystem that became established on land, a good 200 million years before dinosaurs first appeared on the scene. With support from my colleague Sue Radford, we have spent three days in the field so far. Already we have made some significant discoveries. 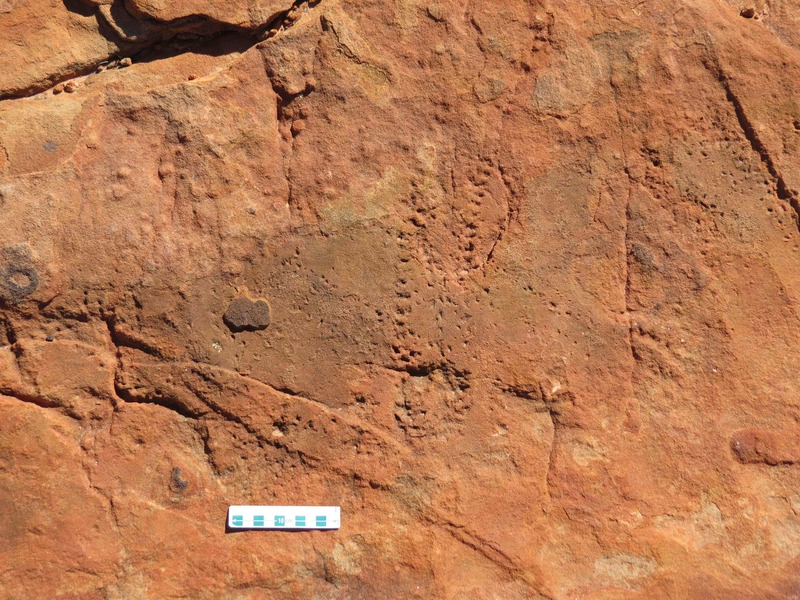 The sandstones in which the fossil evidence occurs in the form of tracks and burrows made by a range of early arthropods (the group that today contains insects and crayfish) outcrop in the Murchison River gorge. 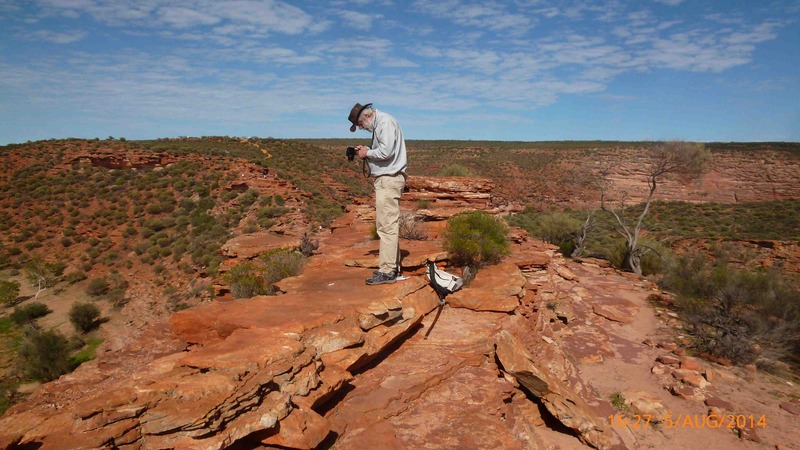 It's a half-hour drive from our base in Kalbarri through the spectacular kwongan vegetation of Western Australia (1100 species have been recorded in the area) to the top of the gorge. The first few days we will be exploring the upper strata in the gorge. Already we have found a number of different fossil trackways. The largest are 24cm across and some meander for 3 metres. Some were probably made by giant scorpion-like animals more than a metre long called eurypterids; others by a range of as yet unknown arthropods. We are also finding lots of evidence of microbial mats, the base of the food chain at a time before there were vascular plants on land. Today's best find was the discovery of a fossilized pond into which one of these arthropods had slid into the water, dislodging a lump of microbial mat on its way. But more on that in the next blog!